Renowned sculptor/printmaker Valerie Maynard will exhibit at Baltimore’s Station North Arts and Entertainment District gallery, New Door Creative, October 22nd through December 22nd, 2017. The exhibition is entitled “Devotion”, and will feature a collection of woodcut and linocut prints. An opening reception will be hosted on Sunday, October 22nd at 3 P.M., and will feature a conversation with the artist. “Devotion” explores a range of subject matter: visual interpretations of characters whose personal narratives have registered an imprint on the artist’s life; and examinations of the spirit of resistance, transformation, and creative intent. The seventeen works included in the exhibition were created over multiple decades of printmaking practice; and reveal an evolution of thought, process, and technique by an artist whose name is synonymous with contemporary art, and the “heart and soul” of the Black Arts Movement. Varied in scale, the works on exhibit singularly and collectively expose a chapter in the continuing story of an artist devoted to the creative process, the history and nuance of the African American experience, and the politics of art-making. Throughout her distinguished professional history of more than fifty years, she has informed and inspired a broad scope of artists, students, educators, and collectors. Born in Harlem in 1937, Maynard apprenticed as a portrait painter with artist Elaine Journey, followed by studying at the Museum of Modern Art. She received a M.A. in Sculpture from Goddard College in 1977. 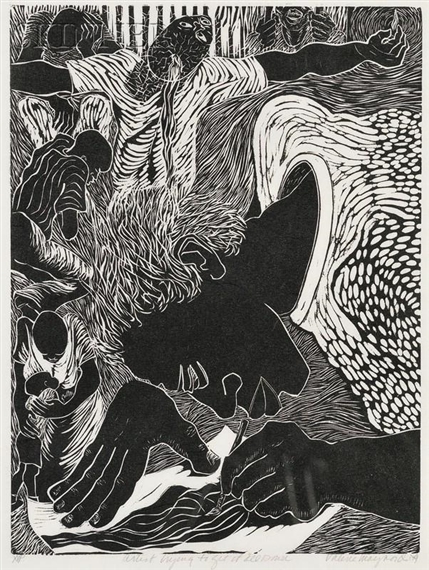 Widely collected, the work of Valerie Maynard is included in the United States Library of Congress, The Brooklyn Museum of Art, Brooklyn, New York, The National Museum of Mozambique, The Massachusetts Institute of Technology, Cambridge, Massachusetts, IBM Corporation, White Plains, New York, The Studio Museum in Harlem, New York, New York, and the Riksutställningar National Museum, Stockholm, Sweden. Numerous public artworks include the New York City MTA Arts in Transit mural (glass mosaic on mezzanine walls and above stairs), Polyrhythmics of Consciousness and Light, which was installed on 125th Street/ Lexington Avenue subway station in Harlem, New York in 2003. Maynard is recipient of The Riksutställningar National Museum Purchase/Travel/Lecture Grant, Virgin Islands Humanities Council Research Grant, The Atlanta Life Insurance Sculpture Award, New York Foundation for the Arts Grant for Printmaking, New England Foundation for the Arts Grant, and The Rockefeller Humanities Fellowship, to name a few. "Valerie Maynard: Devotion" is made possible by the generous support of In4structures.